For a long time, hops were used in the brewing industry in the form of cones. Today, they are primarily used in the form of processed products. Globally, over 95% of hops are used in the form of processed products, primarily as pellets (types 90 and 45) as well as in the form of extracts (CO2 and ethanol). In the Tettnang growing region, cone hops are processed to produce type 90 pellets. 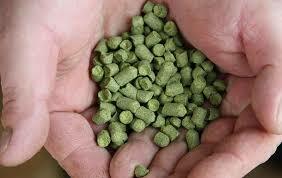 There are two main types of hop pellets – type 90 and type 45. The type name provides information about the approximate percentage content of the processed quantity of raw hops. With type 90, approximately 90 kg of pellets are obtained from 100 kg of raw hops; with type 45 around 45 kg are obtained. The difference between the two product types lies in their processing. 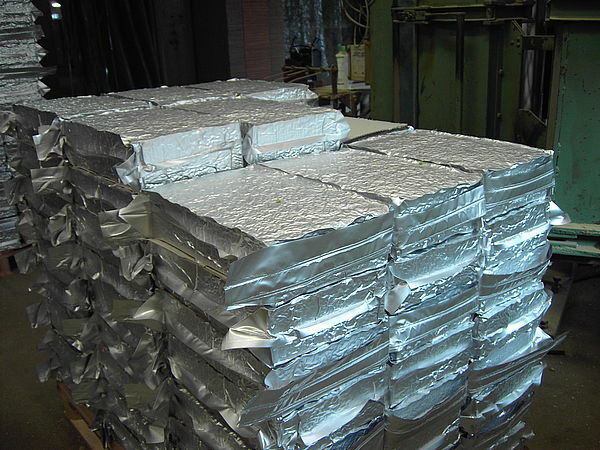 Whilst the production of type 90 is limited in principle to cleaning, drying and grinding the hops, processing to make type 45 pellets includes mechanical finishing of the hop powder to produce a predetermined, uniform bittering substance value. Hop extraction is the oldest step in hop processing. The constituents were originally extracted using water or steam. Today’s highly developed extraction processes use ethanol or carbon dioxide to preserve the pure and natural hop product and then integrate it into the functional processes of the modern brewery. Hop extracts are ideal for clean, simple analysis, are easy to dose and can be transported and stored without cooling. In addition, they offer advantages such as improved exploitation of bittering substances, minimum storage room requirements, the possibility of standardization to a predefined substance content and the absence of cloudiness caused by hops in the brewing process. 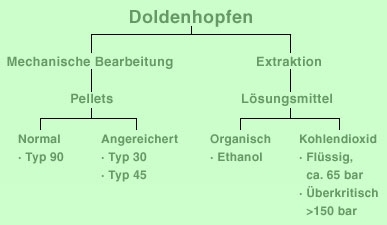 Isomerised hop products are chemically modified products which are not permitted for use in Germany due to the beer purity law (Reinheitsgebot). They can be divided into two groups: firstly, products used in the brewhouse (kettle products), and secondly post-fermentation products. Products intended for the brewhouse are either isomerized hop pellets or isomerized hop extracts (kettle extract). The post-fermentation products, as the name suggests, are used after fermentation and are usually dosed into the finished beer during the filtration stage. Another type of product, the hop aroma products, can similarly be divided into two groups – products used in the brewhouse, and post-fermentation aroma products. Hop cones can either be pressed into ballots or packed into compact vacuum packs known as vacupacks. Both cone hops and ground hop powder are packed and sealed under vacuum into 5 kg vacupacks. This type of packaging not only reduces the volume, it also protects the contents from damage caused by exposure to oxygen. Vacupacks are ideal for breweries which, despite the wide variety of different hop products in existence, do not want to dispense with cone hops entirely.